Built 1888-1889 by Ferdinand Fellner & Hermann Helmer as a private theatre for Count Miklós Esterházy. Opened 4 Oct 1889. Ca. 300 seats. Closed after Esterházy's death in 1897. Demolished in 1913. 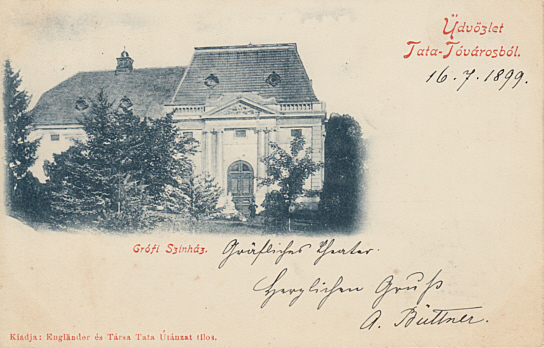 Front Text: "Üdvözlet Tata-Tóvárosból, Grófi Színház"
Handwritten Front Text: "Gräfliches Theater"